2)Learn from Reuben vision on the cost benefit analysis on the feeding Programme in the school. 3) Share experience and ideas on how the bio-digester works and explore business options suitable for the project. The total number of participants who attended the session included 10 teachers, 4 school committee members, 2 students and 2 members from the kitchen in total 18 members from Ngunyumu primary attended the session. Reuben vision primary school started in the year as per 2016 it was there 6th year of sitting for the Kenya certificate of primary education .Like most schools in the informal settlements the most glaring issue that the school faced was daily exposure to inadequate sanitation ,although they had various toilet options this options were unhygienic, expensive and unsafe for the school going children ,those students unable to access safe and affordable sanitation facilities were left with no option but openly defecate or use “flying toilets “. Reuben vision primary school for the longest time depended on on- plot toilets that had been built right opposite the school where they had to pay Ksh 3000 per month in order for the students to access the sanitation facility which was unsafe and unhygienic. The amount charged monthly was dependent on availability of water at the toilets; lack of water meant an increase in charges and times the owner would be forced to shut down the toilet due to poor hygiene and unhealthy practices leaving the school management with no alternative. Umande started the construction of the bio-center in 2011 and a year later the bio-center was officially launched in 2012, although the production of biogas did not start immediately, the gas was produced after approximately 4-5 months and since then the school has never had any other form of energy for cooking .prior to the bio center the management used other form of energy for cooking which included charcoal, firewood, and kerosene on a monthly basis the school would spend close to ksh 5000 per month . . The bio center serves both students and the community members, the community members use the sanitation facility at a fee of ksh 3 for toilet, ksh 5 for showering and ksh 10 for showering with hot water, the school gets a substantial amount from payment use of the facility. The facility also has 4 rental houses which generate income to the group; cleanliness of the facility is maintained by a caretaker who is stationed at the facility. Looking at the cost benefit analysis there expenses have reduced by 80% and the students no longer suffer in terms of sanitation needs and feeding Programme of the school. The biogas is used for preparing meals and running the feeding Programme in the school. The students report to schools as early as 6.ooam breakfast and lunch is provided in the school. Some few students also board and are provided with meals during the term and holidays. Because it’s a government institution determining the business model is quite complex so the school is at liberty to choose best option that suites the school. At the end of the day the team members had understood most of the processes that go on in the bio digester and how to maintain the toilets and the kitchen facilities in order to have maximum production of gas. 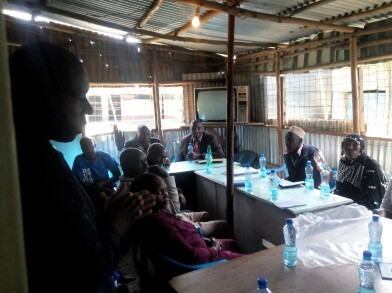 The training session was a success and the group understood how the system operates.